In need of a few creative ways to celebrate Earth Day? The activities on this list can be used in a variety of settings, and are a great way to improve fine motor and sensory motor skills. Take a look, and discover how you can incorporate these crafts and garden games into your therapy sessions year-round. Happy Earth Day to all! 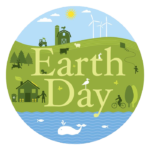 Stay on the look out for Earth Day activities perfect for kids, and let us know what you’re doing to celebrate.